Join a mischievous forest sprite called Poa on the highly entertaining Wishwood Slot and have a whale of good times! This mystical themed slot comes packed with 5 reels and 20 paylines. During the game, you are taken to the mystical forest to find the untold riches. The background overlooks an enchanting forest with the little spirit on the left-hand side. 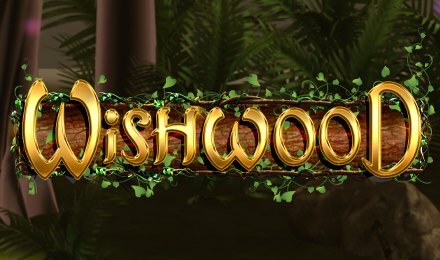 Delight in the astonishing gameplay of Wishwood Slot and have an unparalleled gambling experience! Start a wondrous gaming adventure by logging into your Wicked Jackpots account and by launching Wishwood Slot! Place your stake using the user-interface found at the bottom of the screen. As soon as you have selected the desired value, press the yellow Spin button. The AutoSpin option helps you activate a series of rounds which are played on their own without any manual intervention. Bet Levels: There are no Bet Levels on Wishwood Slot! Amount of Paylines Selection: The 20 paylines cannot be altered during the gameplay. Coin Values: Coin denominations range from £0.20 to £400.00. The Wild Symbol of the game can take the place of all other symbols to form winning combinations, except for the Bonus Symbol. What’s more? It can grant up to 500x your stake for 5 of its kind on the reels. During the Bonus Climb on Wishwood Slot, when Poa reaches branch 3 to 6, the Amber Wilds Bonus Feature is initiated. Here, you will catch hold of 7 free spins to try your luck! In the base game, you can trigger the Mystery Picker on any winless spin. Hence, you will luxuriate in one of the following extras: Wispy Wilds Feature, Magic Multiplier Feature, Tangled Symbols Feature or Bonus Climb. In this enticing round, you are provided with 8 free spins. Simply select a special symbol like the Butterfly, Squirrel or Owl. This superb symbol will then expand over an entire reel after each free spin. What’s exceptional is that the symbols found between the superb ones also become special to initiate potential big wins. Whenever Poa lands on branch 7 through 10, the Enchanted Wilds Bonus feature is triggered. Here, you get to benefit from 5 free spins and each Wisp symbol loads the next accumulator circle. The aim is to load 3 of them so that the next animal symbol transforms into Wild for the duration of the Free Spins feature. When all 3 animal symbols change to Wilds, you can also get 5 extra free spins. Let Poa guides you through the secret path which leads to great riches on Wishwood Slot!